The interior of J. Pierpont Morgan’s Library consists of three rooms radiating off the east, north, and west sides of the Rotunda, a vaulted entrance foyer. 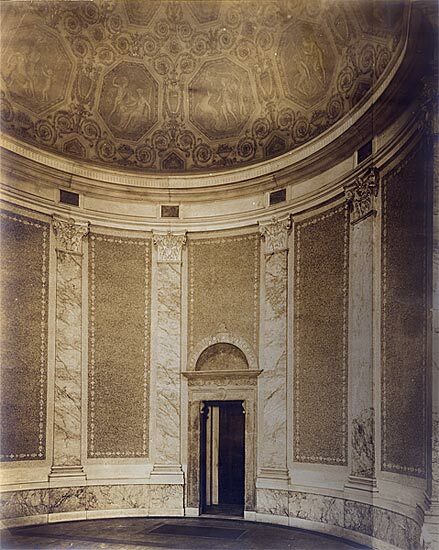 The largest of the three served as Morgan's library, the room to the west was Morgan's private study, and the smallest of the three, to the north, was an office for Pierpont Morgan's librarian, Belle da Costa Greene (1879–1950). The restrained simplicity of the façade yields to the splendor of color and texture in the Rotunda, supplied by variegated marble surfaces and columns, mosaic panels, and columns of lapis lazuli. The marble floor, with its central porphyry disc, owes its design to that of the Villa Pia in the Vatican gardens. The decorative programs for the apse, ceiling, and lunettes of the Rotunda were designed and executed by Harry Siddons Mowbray (1858–1928). Mowbray quoted liberally from Renaissance prototypes, relying principally on the works of Raphael (1483–1520) and Pinturicchio (1454–1513). The decorations of the Rotunda announce the building's role as a repository of the art and ideas of the past, from antiquity to the Renaissance. The decorations on the blue and white stucco ceiling of the Rotunda's apse are a tribute to Raphael, based on his designs for the Villa Madama in Rome, executed in 1516 for Cardinal Giulio de' Medici (later Pope Clement VII). Against a background of urns and acanthus foliage, the hexagons depict classical figures representing Wheat, Flowers, the goddess Ceres, the Vine, and Fruit. The Larger reliefs represent Venus and Cupid, Mercury and Proserpina, Diana and the Huntress, Cupid and Psyche, and Silenus with the young Bacchus. Mowbray modeled these reliefs in situ, to ensure proper lighting from the oculus. 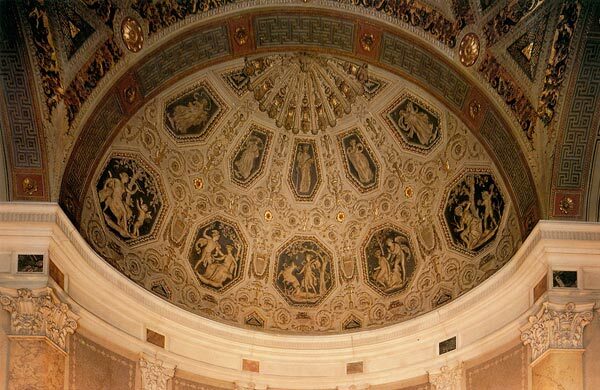 The paintings of the Rotunda's dome are compositionally inspired by Raphael's famous vault decorations for the Stanza della Segnatura in the Vatican (ca. 1508–11), commissioned by the great humanist pope and patron of the arts, Julius II. Four branches of learning—Religion, Philosophy, Science, and Art—are personified by female figures situated in roundels and surrounded by putti. The four rectangular panels above the spandrels depict The Annunciation, The Crowning of Art (a variation on Raphael's Crowning of Apollo), The Triumph of Light over Darkness (also known as Force Chained by Wisdom), and Knowledge Transmitted (The school of Plato).